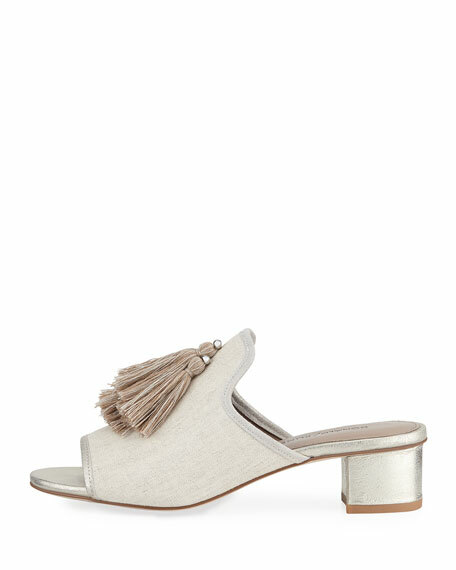 Donald J Pliner canvas mule with tassels at vamp. 1.5" metallic leather chunky heel. Foot Friendly: About Donald J Pliner: From the very beginning (he launched his line in 1989), Donald J Pliner has been devoted to designs that are both comfortable and chic. He calls it "high-fashion comfort" and refuses to believe that shoes can't be both stylish and wearable. For in-store inquiries, use sku #2553958.